I'm not sure about you, but I've avoided Chinese food completely since becoming gluten free. There's always the fear of soy sauce lurking around every corner, and indeed, in every dish. A solution - and an absolutely fabulous, Michelin-starred solution at that - the exquisite, delicious, and gluten-free friendly Hakkasan. Yes, this is not one for a weekly visit, it's very pricey, but oh my oh my is it worth it for a special occasion. The staff are so knowledgeable that the fear of being poisoned, the need to ask annoying questions and to be on guard at all times completely disappears and I was happy to be coddled in their safe GF arms. I went for fried. Golden fried soft shell crab with red chilli and curry leaf, to be precise. I mean, we all know that the opportunities for us to get our gluten free mitts on something fried are few and far between, and I thoroughly intended on taking full advantage of the situation. Not least because it was my birthday, and my dear sister was treating me. Ahem. Needless to say, it was utterly stunning and my jaw near dropped to the floor, before moving back up again to hastily munch down the rest of the dish. It was full of flavour and overall simply divine. At this point the lovely waitress put down three sauces and kindly pointed out which ones were gluten free, and which ones off limits. Also worth a mention, for my sister who is vegetarian, the waitress pointed out that one sauce had a small amount of shrimp paste in so wouldn't be suitable for her. Thoughtful, no? 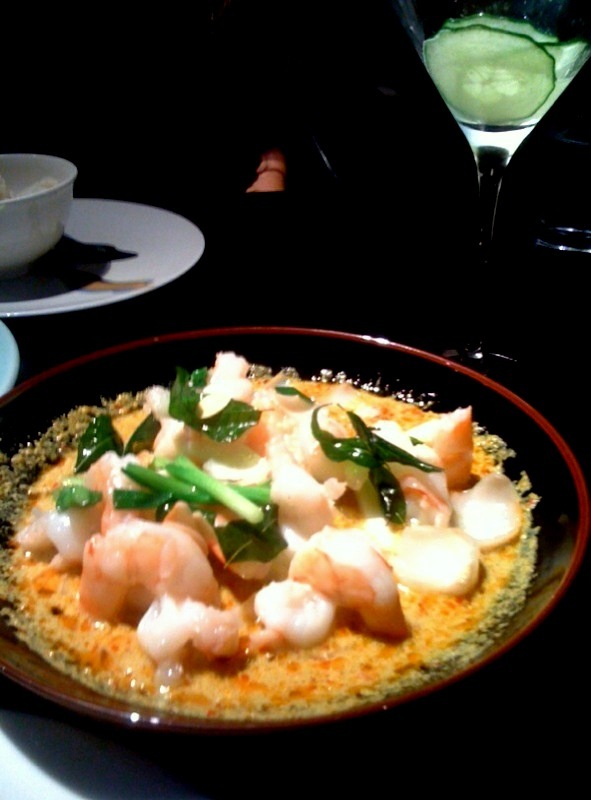 My main course was the spicy prawn with lily bulb and almond (never tried lily bulb before! It's somewhere between a water chestnut and a bamboo shoot. Tasty). Hubbada hubbada. Giant juicy butterflied prawns on an almost curry like sauce. With some simple rice and baby pak choi, it was heavenly. Sweet, tangy and rich all at the same time. Drool. Oh, and apologies for not setting the scene earlier - the dining room is stunning with its carved black partitions and perfectly dim lighting and soft air conditioning with some sort of delicious smell wafting from somewhere at all times. Tranquil and elegant. With all of this being washed down with a Saketini or two, well I must say, I was a thoroughly happy, stuffed, birthday girl. UPDATE: There are now two branches of Hakkasan. I went to the Hanway Place restaurant. I have heard bad things about the Mayfair restaurant, see comments below. I have been to Hanway place three times and had a consistently good service. Please do call before you go to make sure they have the extensive gluten free menu (also posted in the comments). I do not recommend Mayfair! Just stumbled on your blog. It's great! I am also a gluten-free food blogger living in London. I had no idea that Hakkasan has a gluten-free menu... I definitely want to check it out now. Chinese dishes are delicious, though you have to be careful on the sauces if you're on a diet. I just went there on your overwhelming recommendation and sad to say, had a completely different experience. Was told only things they could do gluten free was lobster[£38], king crab[£40], or wagyu steak [£62!]. Only after complaining, they decided that , yes, the roast chicken can be done without a sauce. So I had a plain chicken with plain rice. Did not get sick but obviously not a wonderful gluten free experience! Michael, I am so sorry to hear that!!! Why did they not give you the gluten free menu? Everytime I go I get a separate menu - it's printed up, and very extensive. That is terrible service that you had - the waiter should not be trying to guess in the moment what is gluten free and opting for over safe options. He should have gone and gotten you the separate menu. Did you go this week? It's not because of London Restaurant week is it? (still unacceptable) Also, I went to the Hanway Place one. They have since opened a new one in Mayfair which I haven't been to. Which did you visit? I took a date (who is coeliac) there last night, based on your recommendation. We both had a very fine dining experience, with wonderful food (if slightly over-attentive service). My bank account was aching at the end though! Well worth it for something special. 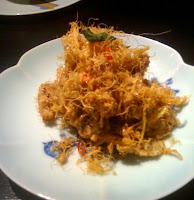 Memories of the soft-shelled crab still make my mouth water. Great Waltworld, I'm glad that you had a good experience of it. I am trying to ascertain if Michael who commented above went to the same Hakkasan, or if he went to the new one in Mayfair that I have yet to go to. Which did you go to? Definitely one for a pay day - or a very special occasion. That is one lucky date you've got there!!! Love your site. We are going to be visiting London in a few weeks from the States. We were in London last summer and had a hard time finding a lot of Gluten Free Options. Thanks for the tips. We will be trying this restaurant. Think things must have changed enormously since your visit. Went last night, apart from the Soft Shell Crab nothing else on the menu was available to me. There was no special menu you speak of. The only thing I was offered was PLAIN steamed crab, PLAIN grilled Wagyu beef or PLAIN steamed fish. Why would I pay £40 for a plate of plain steamed crab or over £60 for plain grilled beef - Wagyu or not. No chef seriously passionate about food or providing as experience would serve up such substandard food. These offerings were not 'meals' but just 'food' - un seasoned, specially prepared or CHINESE at all. Why go to an upmarket CHINESE restaurant to be offered plain steamed fish. It is very easy to whip up a simple gluten free soy sauce based sauce or dip. Clearly the chef/management feel Coeliacs should just be grateful the get food at all. No passion for food here, no providing and experience, no creating gastronomic delight, no class. Which Hakkasan did you go to? I would love to go and visit them to see what happened, and where the menu has gone! They must change it back! interesting there is hakkasan just near me I will have to check it out, which one did you go to? rediculously short sitting/time limit of a strict 2 hours no exceptions - no sllow social or romantic meals here. example - the couple next to use was enjoying a bottle of Cristal (so not a cheap night out), the time limit on their table expired an they were rudely kicked of the table back to the cramped bar. I forget why now, but we complained about somthing and were made to feel like Lepers. My experience was at the original Hakkasan, north of tottenham court road. I believe the mayfair one seems to be different, and people have had rude service there. I've always had a great experience there. Yes it is expensive, but I felt very well treated. I'm sorry to hear that you haven't. I called Hakkasan and they immediately emailed me a gluten free menu. There are lots of choices and the small amendments, (like no chinese wine), I'm appreciative of, because it still gives me choice, and it's not like a "no gravy roast", it's Michelin starred amazing food, even with amends. Please do keep your comments coming, as I have only been there three times, and have had good service on all occasions. I can't speak for the Mayfair branch. I am totally surprised to see this on here. I went to Hakkasan for my birthday, having heard it did a gluten free menu. We booked, and they confirmed this. When we arrived, the gluten free menu had 4 main dishes on it, 2 of which you had to order more than 24 hours in advance and 1 of which was c. £60. When I complained that we weren't told when we booked that half of the gf "menu" needed to be ordered in advance, we were met with a shrug of the shoulders and told there was nothing they could do - there was no way to do any other dish. We left (amid more couldn't-care-less shrugging), and went to one of favourite restaurants in london - Bar Boulud - which has gf bread and loads of gf options. I would never go back, or recommend, Hakkasan (at least the one in Mayfair) to anyone. It seems like the Mayfair branch is the problem. The Hanway place one has the gf menu (above comment) and they are great. I will make it clear not to go to Mayfair. I would remove it, but it's the only Chinese that is GF that I have found!